INVOLVEMENT ON CAMPUS: I’m on the football team. I also was an emcee for the Demo Show last year and will be doing that again this year. The Demo Show was a really great experience. I was able to help make chemistry, physics, and engineering fun and enjoyable for young kids in our community. I only had a minor role in doing that, but seeing how hard our Wartburg faculty and students worked to make that happen made it a real honor to be part of. I’m also helping out in the Innovation Studio for the engineering science department. 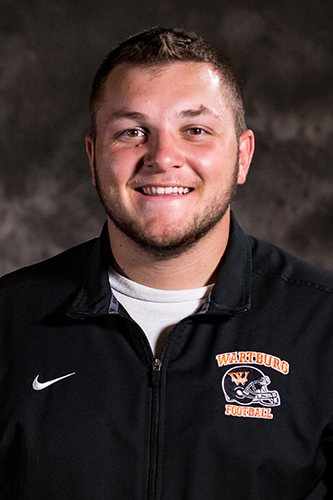 WHY DID YOU CHOOSE WARTBURG: It was a mixture between our football team and the fact that we have an engineering science department. I also heard about the job placement rate, which was outstanding. I learned that many of the engineering science students who went here ended up working for John Deere, which has all ways been a dream job – and look at where I’m at now. I’d say I made the right choice. WHERE ARE YOU NOW: I’m a part-time student at John Deere. I applied for a job over the summer and got a year-round job. I’m a quality engineer, which means I focus on making sure our products meet all the print specs and that our assemblers don’t cut corners by mistake when they’re proofing the assembly line. WHY DID YOU CHOOSE ENGINEERING SCIENCE: I’ve always loved to solve problems creatively, like thinking of an “out-of-the-box” solution for something that isn’t working properly. Naturally, that led me to become an engineer. Also, it sounds weird, but I love working with mathematics and physics. Completing and understanding concepts is a very accomplishing feeling for me. WHAT HAS YOUR ACADEMIC EXPERIENCE LOOKED LIKE SO FAR: I really enjoyed ES 151: Modern Engineering Analysis I and ES 152: Modern Engineering Analysis II, where I was able to use the same strategies that an engineer would use to problem solve and design products. We had to design a board game for a patient with cerebral palsy. We also recreated a 3-D model of a real-life object in CREO modeling. WHAT IS THE ONE THING YOU NEVER IMAGINED YOU WOULD DO BEFORE COMING TO WARTBURG: The Demo Show came out of nowhere. Dr. Christine DeVries came up to me after a class one day and asked me if I would want to emcee. Of course I said yes, but I really didn’t expect to do anything like that here. WHAT ARE YOUR PLANS AFTER GRADUATION: I’m still three years away from graduating, so I’m still deciding on it. Right now, it’s between working at John Deere or going on to graduate school. Either way, I’m excited for the future.